Are you searching for the best home theatre speakers, but with so many options available are having a hard time finding the perfect match for your needs? In this buyer’s guide present 10 speakers that each brings something different to the table. We cover all the features that are implemented to give you a good overview of what you’ll be getting. Also, we have rated them from 1 to 5 so that you get a sense of their quality at a glance. However, if you’ve never bought a set of home theatre speakers before then don’t worry as we have created a buying considerations section. Here we go into detail on the important factors that should be considered before pulling the trigger on a purchase. Even if you don’t buy from us at least you would have gained the necessary knowledge to purchase the best set of theatre speakers elsewhere. Also, we have created three price categories so that you can go to your budget range and find suitable options. We have searched the marketplace and found that the 10 in on this list are the best options available. We hope you enjoy reading this buyer’s guide as we did writing. Comes with control console and multiple ways of connection. 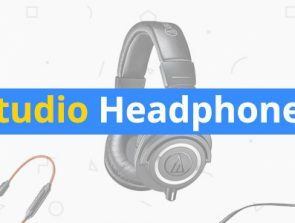 Has cinema-like audio and stable Bluetooth connections. Has a Class-D subwoofer and wall mountable. Wattage: the number of watts a speaker system has can tell you a lot about how loud the audio will be. Around 400 watts will be enough for any small home as it will fill up the room with vibrant sounds. Mainly, the subwoofer will contain the most wattage as they use a lot of power to deliver soothing bass. Ideally, you want the subwoofer to have more than 100 watts. Built-in EQ: having a built-in EQ is a tremendous bonus as this means you can tune the audio to your preferences. This gives you the ability to increase the bass or lower the treble depending on what you’re watching. Some setups come with their own EQ application so you get an abundance of presets. Frequency response: having an ultra-wide frequency response improves the audio because you’ll enjoy more detail. Most home theaters have a frequency range of 20 Hz – 20k Hz, which is enough for the average household. The speaker brand can tell you a lot as companies have to uphold their reputation, which means they will consistently produce the same quality. If you’re unsure about some brands then consider going to various review sites to check out customer experiences. Also, you can look at online unboxing videos, which is a great way to find out what to expect when the speakers arrive. Bluetooth: with Bluetooth you can enjoy wireless freedom and stream your favorite songs directly from your smartphone. The connection range usually is wide enough to go throughout your whole home, but sometimes interruptions can be heard if there are objects in the way. Auxiliary wire: unlike with Bluetooth you can connect with an auxiliary wire, which is a great alternative as it provides HD quality audio. However, make sure that the AUX wire is made from premium materials because otherwise, the audio quality won’t be as good. Also, if you notice the wire is damaged then replace it immediately as you may hear crackling in the audio. Stereo: connecting to a stereo is one of the best methods since most newer ones have all the connection methods available. You can connect all speakers to a stereo with RCA cables, which are easy to plug in without taking much time. Pay attention to durability to ensure you receive a long lasting product that won’t frustrate you due to damage. The materials used are extremely important as some materials are more durable than others. Also, the drivers should be made from neodymium as they are the most long-lasting. Also, you can get a multiple year warranty deal, which means you will get a replacement as soon as any one of the speakers get damaged. This comes at an extra cost, but it’s well worth it as you never know when a driver can blow out. Before purchasing the home theatre set make sure you have a place where to put them as they do take up a lot of room. Some speakers come with mounts so you can easily place them onto a wall to relieve space. There are multiple mount designs that speakers use. The most common one is the keyhole design, which only requires a screw in the wall. Also, make sure that the subwoofer has legs as they usually have rubber or soft material underneath so they won’t scratch the floor. However, if the woofer doesn’t have floor legs then place it on a carpet or other soft area. 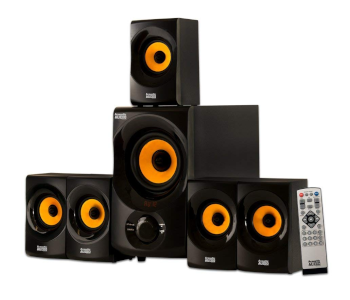 Are you searching for the best budget home theater speakers, but so far not had any luck finding an option that matches your requirements? In this price category, we show you six options that are high-quality and don’t cost much. They offer excellent sounding audio as the speakers have been tuned to perfection and work with any music genre. Also, setting up the speakers is extremely fast as they only require a few plugs. The Logitech Z906 5.1 Surround Sound Speaker System uses advanced technology that lets you hear every little detail. The speakers are also THX certified, which means they can produce cinema-quality sound. Also, you can tune the drivers yourself as it comes with a control console with multiple switches. Therefore, you can increase the bass or treble depending on what you’re listening to or watching. The combined power of all the speakers is a continuous 500 watts, which is enough to make your house shake with audio. Under the right circumstances, the peak power can go all the way up to 1000 watts, making activities such as parties more lively with music. Moreover, connecting to the speakers is easy as it has multiple inputs such as RCA, six-channel direct, optical inputs, and 3.5 mm auxiliary inputs. You also have the option to purchase these speakers with a Bluetooth adaptor so you can connect wirelessly, which gives you more freedom and play music from a distance. Setting up the speakers is easy, but make sure you have space ready as they do take up a lot of room. Also, the 1000 watts of power may be too much for some home setups, unless you like hosting events such as parties. 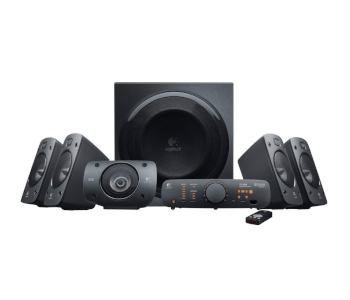 To summarize, the Logitech Z906 5.1 Surround Sound Speaker System uses advanced THX technology that makes the audio sound enhanced and give a cinema-like feel. You can tune the drivers to your preferences as it comes with a control console, which has many switches to adjust the bass and treble. Also, the total power of the speakers is 1000 watts at peak power, so using them at house parties is ideal. The included receiver in the Onkyo HT-S3900 5.1-Channel Home Theater decodes Dolby TrueHD and DTS-HD Master Audio, which sounds more detailed giving a lifelike feeling. Now you can enjoy authentic moments in movies with full HD audio thanks to the technology and well-tuned drivers. The speakers have built-in Bluetooth technology so playing music from your smartphone couldn’t be easier. The aptX codec helps deliver better-sounding audio when in wireless mode and the Advanced Music Optimizer mode enriches any compressed audio for a more satisfying experience. Also, you can connect with a USB stick, which lets you have thousands of songs depending on the storage size. The subwoofer that comes with this set is extremely powerful helps bring more life to the audio as it can deliver thunderous lows. Also, when watching movies or listening to intense bass beats the low-frequency speaker makes the audio come to life. Setting up the speakers can take some time as you need to place them in the correct spots and attach the wires. Also, when in Bluetooth mode you must stay within the connection range because otherwise, the audio won’t be as clear. 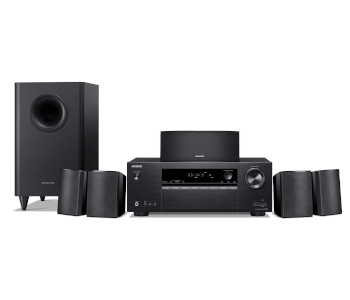 To conclude, the Onkyo HT-S3900 5.1-Channel Home Theater is an excellent budget choice as it comes with multiple speakers that helps deliver a surround sound feeling. The technology used enhances the audio, which gives off a lifelike feeling. Also, you can tune the drivers yourself since it has a built-in EQ. 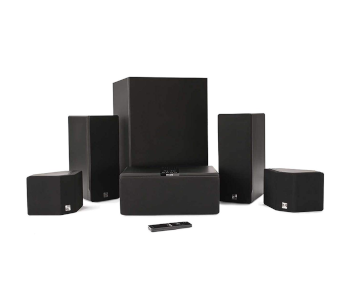 The Rockville TM80B Black Home Theater System uses dual 8-inch subwoofers that deliver excellent lows. Therefore, action scenes and bass boosted songs sound tremendously good. The two silk dome tweeters produce incredible highs that make vocals sound accurate. Also, you can tune the drivers with the remote control to make the audio sound the way you want. The peak power of these speakers is 800 watts, which is enough to make your house shake with premium HD audio. Thanks to the quality of the drivers the audio always sound great and no distortion can be heard at any volume. Don’t like the way the audio sounds, but have no idea how to tune them? Don’t worry as you will get a bunch of presets, which can be used for separate occasions whether you’re watching the news or listening to music. Also, the build quality is nothing short of excellent as it uses premium materials, which are long-lasting. The wooden design comes in 3 styles so you can pick the one that you like most. Not only can you pick the style, but also the size of the woofer drivers. The built-in Bluetooth has a range of 150 feet, which is a lot, but this means you must keep your Bluetooth device near your home. Also, the 800 peak watt power can be damaging to your ears so make sure you don’t stand close. 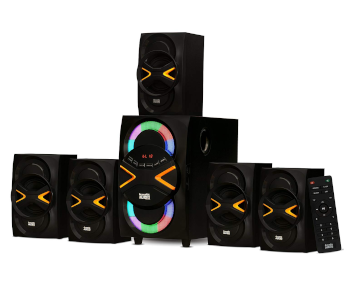 In conclusion, the Rockville TM80B Black Home Theater System is a brilliant choice as it comes with many features. The remote control can be used to tune the drivers to your preferences and you have multiple presets to choose from. Also, you can pick from the 8-inch or the 10-inch driver versions depending on how loud you need the speakers to be. The Leviton AEH50-WH Architectural uses a five-channel system that can be expanded to 6.1 and 7. Adding additional satellite speakers will result in surround sound, which immerses you into the action. Video magnetic shielding allows the speakers to be placed near your TV without causing screen problems. In the box, you will receive an 8-inch subwoofer that has the power of 100 watts, which means you can enjoy bass focused songs and experience films in a different light. Also, you get 5 mini-speakers that come with mounting brackets so you can place them anywhere in your room. Also, you get to choose between the white and black design depending on your current setup. Connecting the speakers is extremely simple as they use AV receivers that connect to the subwoofer. Also, the woofer has RCA cables, which connect to your smart TV or stereo. The subwoofer comes with 4 legs so you can place it on the ground without fear of scratching your floorboards. However, make sure to place the speakers all in one room as the signal may not reach far enough and a crackling sound will be heard. Also, the white design can be eye distracting if you’re watching a film at night since they will be visible at all times. To summarize, the Leviton AEH50-WH Architectural is a great choice for people who want to have the option to upgrade their system, as with AV receivers you can add as many satellite speakers as you want. The subwoofer can deliver vibrant lows as it has a power output of 100 watts. Also, the satellite speakers come with 5 mounts so you can place them anywhere in your room. The total power of the Acoustic Audio AA5170 Home Theater 5.1 Bluetooth Speaker System is 700 watts, which is more than enough to make films more immersive. The speakers can get extremely loud and no distortion can be heard thanks to the well-tuned drivers that work great together. Also, the wide frequency response of 20 Hz – 20k Hz allows the drivers to play more notes. You can connect to the speakers using a 3.5 mm auxiliary wire, but make sure the cable is of premium quality. Otherwise, the audio quality won’t be as good, since the transmitted waves will get somewhat distorted. RCA cables is another good connection method because you can connect to your TV or stereo. The speaker build quality is extremely durable as it features tough materials that are long-lasting. The speaker design features an all-black style with the drivers being a different color. You can select between three color designs and pick the one that matches your style most. Also, you get a remote control that you can use to adjust the volume, skip tracks, and turn the speakers off. The Acoustic Audio AA5170 is a budget set of speakers so the audio quality won’t be compared to other premium options, but for such a cheap option the audio is great. The remote control doesn’t always pick up a signal so you may need to go closer to the speakers or angle the remote a certain way. To summarize, the Acoustic Audio AA5170 Home Theater 5.1 Bluetooth Speaker System is an excellent choice as it comes with well-tuned drivers. The subwoofer delivers incredible lows that sound amazing when listening to bass boosted beats. Also, you get multiple connectivity methods such as 3.5 auxiliary. Lastly, you can pick from three designs, which means you get more customization. The Acoustic Audio by Goldwood 5.1 Speaker System is powered by 6 speakers that together produce 600 watts of power. The frequency response of 20 Hz – 20k Hz lets you hear more detail in the audio, which makes movies more immersive to watch. Also, the subwoofer produces excellent bass that makes the floor shake. Integrated into the speakers is a Bluetooth receiver so you can play your favorite beats from your smartphone wirelessly. 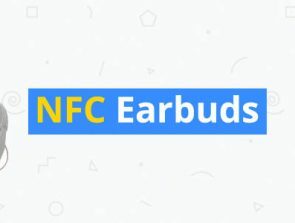 However, if you want to save phone power by not using Bluetooth then you can connect a 3.5 mm auxiliary wire, which produces clearer audio. The speaker design is unique featuring a multi-color theme on the subwoofer. The black color of the speakers makes it blend in when in dark rooms, which means when watching movies it doesn’t catch your eye. Also, you receive a remote control that can be used to adjust the volume, skip between tracks, and turn the speakers on/off. The multi-color design on the subwoofer is more of a gimmick and doesn’t add to the audio experience. Also, make sure to use a premium AUX cable because otherwise the audio won’t be as smooth and some crackling will be heard. 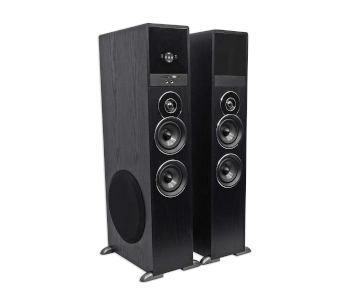 To summarize, the Acoustic Audio by Goldwood 5.1 Speaker System is an excellent choice as it can deliver soothing beats thanks to the well-tuned drivers. The remote control can be used to adjust the audio and skip between tracks. Also, the speakers feature a Bluetooth receiver so you can play songs wirelessly from your smartphone. Are you searching for the best home theater speakers under $1000, but so far not had any luck in finding what you need? In this category you will be presented with the best options the marketplace has to offer. Each option offers their pluses and they all produce premium sounding audio. The Orb Audio: Mod1 Mini 5.1 Home Theater Speaker System is hand-made in the USA from premium materials, so you are going to receive a durable piece of kit. Due to the premium materials, the speakers feel and look pristine. The dual port design of the subwoofer lets the device produce clear accurate bass that makes action films more enjoyable to watch. The frequency response of the cabinet goes from 50 Hz – 180 Hz, so the audio has a lot more detail when compared to other woofers. Also, the subwoofer size isn’t that big, although the sound output is incredibly loud, which means you can place it anywhere in your room. Also, you can choose between 6 color designs, which adds more personalization as you can pick the one that compliments your setup. Setting up the speakers is extremely fast as there are instructions included. Moreover, you get a lifetime of customer support for free, which means if anything goes wrong you have a place to turn for help. There is no immersive surround sound with these speakers, but the audio quality is nothing short of excellent. Also, these speakers are not wall mountable so you’ll need a place where to put them. In summary, the Orb Audio: Mod1 Mini 5.1 Home Theater Speaker System is a brilliant option because it comes with highly tuned drivers that work with any audio. The subwoofer compliments the setup well as it has a low-frequency response of 50 Hz – 180 Hz. Also, the speakers are built in the USA, so all components are of the highest quality. The Klipsch Black Reference Theater Pack 5.1 has surround sound so when watching movies you are completely immersed in the action. The audio is extremely clear as the drivers were tuned to perfection to work with all film genres. The audio detail is excellent as the frequency response is ultra-wide so it can play more notes. In the box, you get 6 speakers that complement each other. The subwoofer produces brilliant lows, while the other speakers take care of the mid to high notes. Each speaker has a keyhole mount so you can easily place them around your room without doing too much work. Also, connecting all the speakers is super fast as they only require a few cables. The build quality of each speaker is done to perfection as the Klipsch brand can invest more money into the home theater. 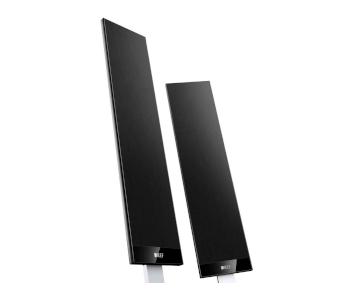 Each speaker has a glossy black design that doesn’t catch your eyes when watching films. 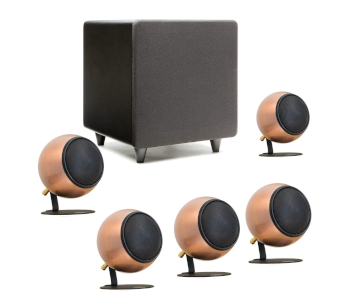 Also, the woofer drivers on each speaker have a copper color, which gives them a unique and stylish look. The subwoofer takes up a lot of space so make sure you have a place where to put it beforehand. Also, the copper design may not look nice for some people so make sure you pay attention to the style before purchase. 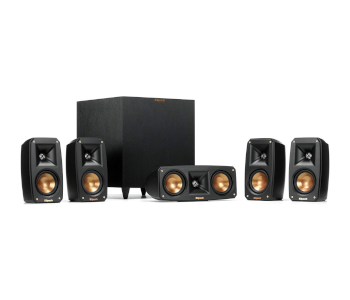 To summarize, the Klipsch Black Reference Theater Pack 5.1 Surround Sound System is a great option since it can deliver soaring smooth bass with its powerful subwoofer. The 6 speakers complement each other well as the woofer takes care of the lows, while the others regulate the mids to highs. Also, each speaker has a keyhole design so you can hang them anywhere on the wall. The KEF T205 5.1 Home Theater System comes with 6 speakers that together produce amazing audio no matter what audio you’re enjoying. The subwoofer produces amazing bass that doesn’t overflow the audio, while the other speakers output great mid to highs. The subwoofer has a total power of 250 watts and is class-D, which should give you an idea of how powerful the lows will be. The speaker design is all black so it doesn’t catch your eye when watching TV, which is a huge advantage as this means you will be fully immersed in the picture. However, if you dislike the black color or think it won’t go with your current setup then you can purchase the white version. The build quality of the speakers is super nice as they are manufactured by premium materials that are also long-lasting. Setting up the speakers is super easy and doesn’t require much of your time since you only need a few RCA cables. Also, you can mount them onto a wall where they won’t take up space and leaves you an area to place other items. This is not a budget set so make sure you have the money to invest in a pricey piece of kit. Also, make sure your stereo can handle the speaker power because if it doesn’t then you won’t hear the full speakers full potential. To summarize, the KEF T205 5.1 Home Theater System is one of the best options out there as it features realistic sounding audio. The class-D subwoofer delivers vibrant lows that enhances bass boosted songs and intense movie scenes. Also, you can mount the speakers onto the wall, which will save space for other objects underneath the setup. The Enclave Audio CineHome HD 5.1 Audio Home Theater System is one of the best wireless options on the market. You can connect to the speakers using your smartphone as it features Bluetooth technology, which establishes stable connections. 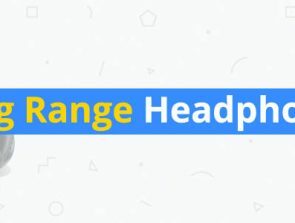 On the other hand, you can use a 3.5 mm auxiliary wire to play music directly and not have to worry about connection range. The audio quality is nothing short of excellent as it features well-tuned drivers that produce lifelike sounds. 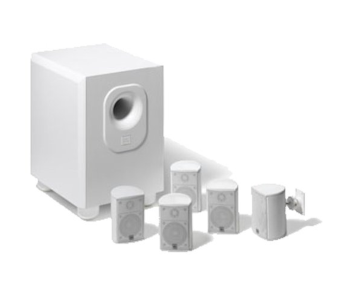 Using a wide frequency response the speakers can use more notes and therefore output more detail in the audio. Also, thanks to the Dolby Digital and DTS technology you can experience cinema-like audio when watching movies. The speaker design is fully black so you’ll hardly notice them when you turn the lights off, which adds to the experience when watching horror films. Moreover, the speaker build quality feels premium and the materials used are long-lasting, so you don’t have to worry about the drivers wearing out after time. Before placing the order make sure you know where you’re going to place each speaker as they do take up a lot of room. 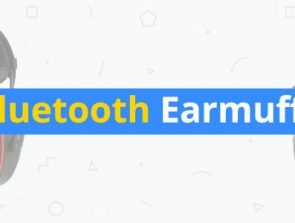 Also, when in Bluetooth mode make sure that you keep no objects between the speakers and the Bluetooth device because otherwise interruptions can be heard. In conclusion, the Enclave Audio CineHome HD 5.1 Audio Home Theater System is a brilliant choice since it comes with built-in Bluetooth. The drivers used are made from premium materials so they will last longer compared to other options. Also, you can experience a cinema-like feel as the speakers use Dolby Digital and DTS technology.